If birders say they love birds ostensibly because they can fly and we cannot, then there must be no more beloved group of birds than the swallows. These aerial acrobats are among the most impressive flyers in the bird world, darting this way and that over open country in pursuit of flying insects. They’ve lived among us for millennia and we’ve appreciated their cheerful attitudes and unquenchable appetites for annoying pests, bestowing the friendliest among them with qualifiers like “Barn” and “House” and “Mosque”, even “Welcome”, in appreciation. Many species build nests of sticks or mud or spit on human-made structures, or in houses we’ve constructed specifically for their use. They’ve long been a symbol of good luck in cultures on every continent save Antarctica, where flying bugs, and therefore flying swallows, are absent. Even non-birders are not immune to their influence, as the term swallowtails is universally known to refer to anything with a “V” shaped fork. 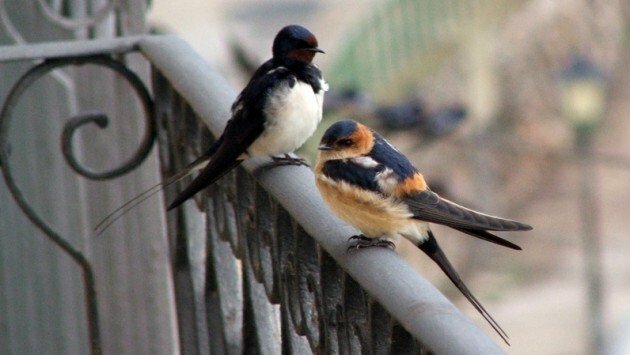 Taxonomically, swallows are one of the few families of birds that has seen little change in its ranks. For centuries, it seems that ornithologists and naturalists have correctly pegged swallows to the right family. Maybe it has to do with their more or less uniform and unique morphology, as the short-forearms and sweeping wings paired with a short, broad bill and tiny feet, are a universal badge of swallow-dom (and in some cases, martin-hood). The family is global in its distribution, with 83 species of around 19 genera. The highest diversity is found in Africa, where the family is believed to have originated from. Those African species, including some flashy birds like Red-rumped Swallow and Lesser Striped Swallow, are mostly non-migratory, oddly enough. This is in contrast to those that burst out of Africa and colonized the globe as hemisphere spanning dynamos chasing blooms of insects from continent to continent. And more, many species have become cultural harbingers of the season, bring spring on their backs from the south and gathering together in truly impressive flocks to head back south again. Always, though, in places where we are apt to see them. We see a lot of ourselves in swallows. That’s probably why they’ve endeared themselves to human culture over the centuries. Pliny the Elder, the Roman statesman and philosopher marked letters with the sign of the swallow. Sailors saw them as good luck. Native Americans hollowed out and hung gourds to attract Purple Martin colonies. William Shakespeare was fond of referencing the swallow in verse and, of course, the famous birds of San Juan de Capistrano were heralded as nothing shot of miraculous for their time-keeping abilities, at least until they left. 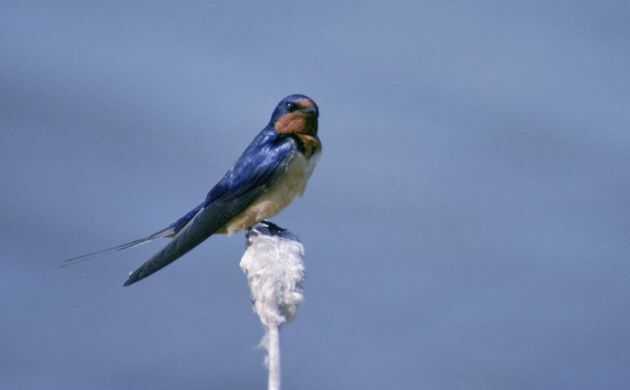 The plucky and cosmopolitan Barn Swallow is the best known, and probably the most likely to nest under your eave, but none of its close relatives are particularly averse to nesting in human-modified locales. American Cliff Swallows may as well be called “Overpass” Swallows for their particular predilection for siting nesting colonies under roadbeds. So much so that their preternatural ability to avoid cars may even be getting an evolutionary bump. Tree Swallows are not so gregarious, preferring a solo nest cavity, but they readily take to nest boxes provided by people in addition to poaching old woodpecker holes. Other species, like Northern Rough-winged Swallow and Bank Swallow, dig burrows in muddy riverbanks, swallow tenements with waterfront views. 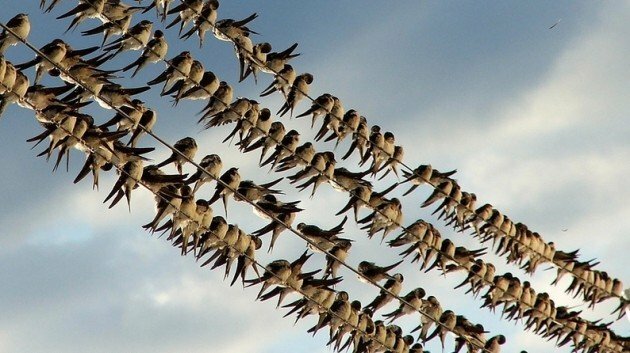 Individually, swallows are amazing birds, but it’s in the fall, when they band together in flocks several thousand strong, that we are able to witness a true bird phenomenon. 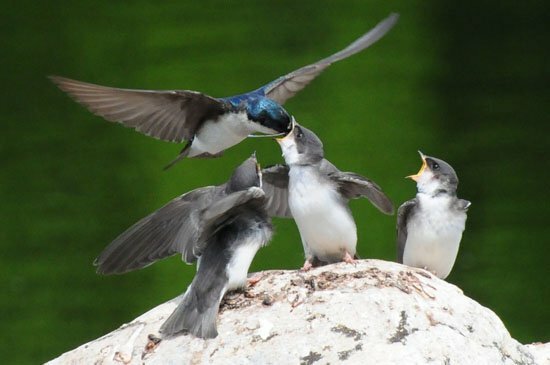 Tree Swallows and Purple Martins are most famous for this behavior, and in the southern US the Trees make flocks that may incorporate hundreds of thousands of birds, swarming together like the aerial insects they devour in impressive numbers. Now’s the time to witness these congregations, and flocks of swallows on powerlines and fencerows slowly gain members. Reaching that critical mass that only they know, one night they’ll rise as one – a tornado of birds –and head south. Til next year. I’m looking forward to witnessing swallow migration in Costa Rica. It’s happening now and will go on for another month or so. Thousands of Cliff, Barn, Bank, and Northern Rough-wings winging fill the skies, mostly in the lowland areas. Pat, I am also very interested in witnessing swallow migration – anywhere in central america! Where in Costa Rica do you think is the best place? On a trip to CR a few years ago I was somewhere on the Pacific coast and had the incredible fortune of catching the spring migration. Several hundred Barn and Cliff Swallows passed by us one morning on their northbound journey. I’ve also seen hundreds of Cliff Swallows in Panama on their spring migration, but I’d really like to see them during the fall migration. Any location tips are most appreciated. I see many swallows in Connecticut this summer! I did not see any during the past 26 years in this area. Is it just because my ignorance of them in the past? Or is it true that there is a sudden jump with their population/migration this year? Where Are You Birding This Last Weekend of September 2013?